FineDEalSoft is an advertising-supported application which we do not recommend keeping onto your computer because it might not only cause problems related to the security of your system, but also disrupt your browsing activities to a great extent. As you might have probably understood, advertisements are responsible for this. You will not be able to get rid of them whenever you want to, which means that the removal of FineDEalSoft is obligatory if you want to avoid all these advertisements. It does not mean which browser you use because FineDEalSoft is compatible with all of them, including Internet Explorer, Google Chrome, and Mozilla Firefox. If you are eager to get rid of FineDEalSoft, but do not know how to do that, you can follow the instructions that we have placed below. After the installation, FineDEalSoft adds extensions to all of the aforementioned browsers and then start showing various commercial advertisements and deals. You might see those ads on different online shopping websites as well. Imagine that you are about to buy some kind of a product and a pop-up appears. It means that you will have to close it in order to see what there is behind it, which is very disturbing and especially annoying. Do you want to get rid of all these commercials? The only really effective solution is to remove FineDEalSoft itself. However, you should be aware that this adware might change its name; thus, if you notice FineDEallsSoft or FineEEDealSioftt on your system, you should know that it is the same application and it has to be removed. FineDEalSoft advertising-supported application might get onto your computer together with other additional software. It is very likely that it comes bundled with freeware and shareware because it has no official website. In order to remove various additional applications, you should always select Custom installation and then unmark all those unwanted programs. If you do so, you will not load your system with unwanted applications. The removal of FineDEalSoft will not be complicated at all, if you follow the instructions that we have provided for you below. 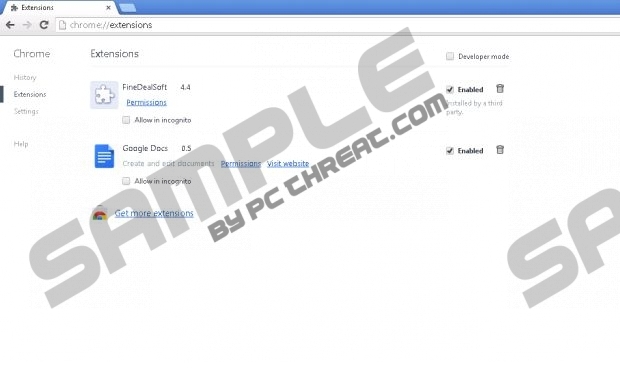 You can also scan your system with a reliable antimalware tool. It will do all the work for you. You just have to launch the scanner and then click Fix Threats button. Click on the unwanted software. Right-click on the useless application. Right-click on the Metro UI background. Locate the Control Panel and then select it. Right-click on FineDEalSoft and select Uninstall. Open your browser and tap Ctrl+Shift+A. Click on the extension and then select Disable. Quick & tested solution for FineDEalSoft removal. How do I keep getting this on my computer. They are making money with hacked computers. How can you not trace this? If it happens again, i'm decompiling it and killing wherever it talks to.